Data is migrating from Radio and Microwave to Light. 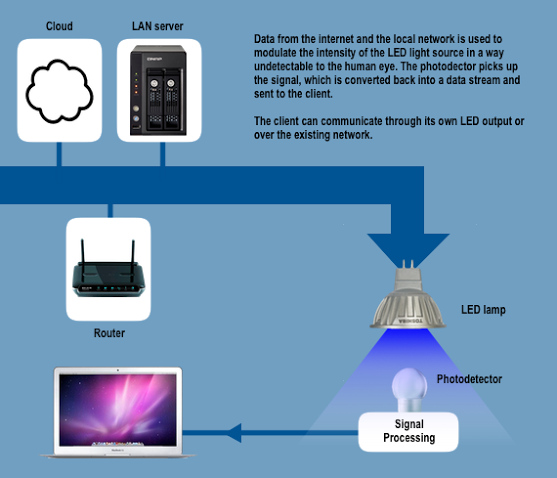 Light Fidelity or Li-Fi is seen as the next order in wireless communication systems moving past radio communications to light based communications. Light emitting diodes are used to transfer light from one source to another – with every light blip signifying binary 1 and 0 otherwise. 1. While the spectrum of Radio communications is limited, light spectrum is endless – with no limitations on capacity. The visible light spectrum is 10,000 times larger than the entire radio frequency spectrum. In contrast, US Federal Communications Commission has warned of a potential spectrum crisis because wi-fi is close to full capacity. The key scale scenario is the ability to use LED lights / 14 billion LEDs in synch with sensors and photo-detectors which could then be used to beam data to the remotest corners of the planet. Even while some parts of the technology are not detailed fully i.e uplink for data from a receptor device to source – it is expected that answers to such issues would come through in the next few years. The LiFi consortium which is an eco-system of LiFi promoting partners believes that while 1.6Gbps speeds have been simulated in controlled environments, LiFi has the potential of getting to 10Gbps data thruputs in near future.